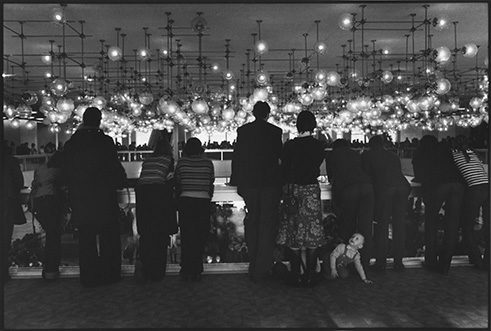 Touring internationally on behalf of the Institute for Foreign Cultural Relations (ifa), works by Sibylle Bergemann, one of the leading German photographers of the post-war era, are on view in New Delhi until Sunday, 3 January 2016. The exhibition is presented by the Goethe-Institut / Max Mueller Bhavan in collaboration with the National Gallery of Modern Art (NGMA). ‘It's the fringes of the world that interest me, not its centre,’ said Bergemann who was from East Berlin. Bergemann died in 2010. The criticism is too subtle to be captured: as Sibylle Bergemann photographs how the monumental Max-Engels Forum is being built in the heart of East Berlin from 1975 to 1986, her photographs resonate with an extremely quiet, barely perceptible irony. For instance, a larger-than-life Friedrich Engels, weighing several tones, seems to hang from a crane – chained and helpless. 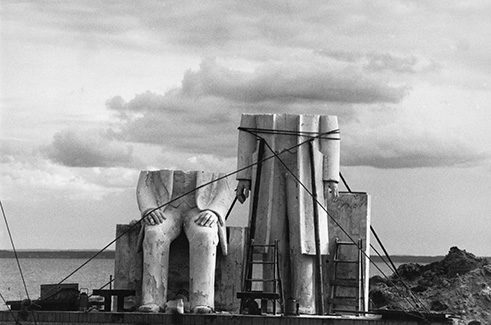 Another photograph shows the two key theorists of Communism, headless and halved. That Bergemann’s photographs do not give the impression of making fun of the bombastic project designed to glorify Karl Marx and Friedrich Engels, is due to their down-to-earth honesty, a special quality attributed to her work. Bergemann’s eye was sharp, perhaps even unrelenting. But never cynical. ‘When there is something in faces or landscapes that doesn't quite fit,’ said Bergemann of her work that brought her out of the ruins of war-torn Berlin to the Baltic, then to the US, and to markets in black Africa. The entire spectrum of her creative work – from early black-and-white photographs to her later Polaroids – can be seen in the 133 photographs on display until 3 January 2016 at the NGMA in New Delhi. 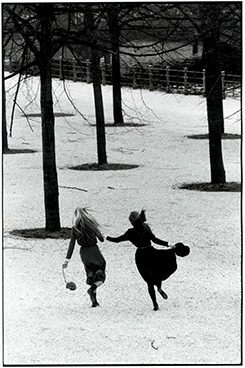 Bergemann, who was born in Berlin in 1941, discovered photography at the age of 25. She worked as a secretary in the editorial department of Das Magazin, an East Berlin periodical, where the photographs printed by the hugely popular magazine aroused her interest. In 1966 she met the photographer Arno Fischer, mentor, teacher and subsequent life companion. In 1967, she had already been accepted by Direkt, a photographers’ collective, and for a long time remained faithful to its manifesto of showing the world without make-up or staging. Mitte, Palace of the Republic, 1978 | Photo: © Sibylle Bergemann Image courtesy the Estate of Sibylle Bergemann Instead of creating a setting, Bergemann relied on her famous eye. ‘Wherever she looked, there was composition,’ Arno Fischer once said of his student and partner. It was not long before the young photographer received regular assignments for Sybille, East Germany’s leading fashion magazine. 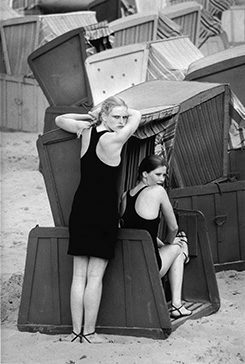 Fashion photography in the German Democratic Republic was by no means apolitical – images had to have approval from above before they could be published. How actually existing socialism was to be portrayed, was not to be left to chance. Bergemann became a leading figure of the East Berlin artist scene and the apartment she shared with Fischer, located directly at Berlin’s Friedrichstraße station, became a meeting point for photographers and artists from all over the world. As early as the 1980s, international colleagues helped her get invitations to go abroad. Bergemann was granted permission to travel and returned from Venice, Paris and the USA with photographs that underline her steady gaze on the world: quiet, calm, sometimes forlorn, but never heartless. ‘It's the fringes of the world that interest me, not its centre,’ she said of her approach. 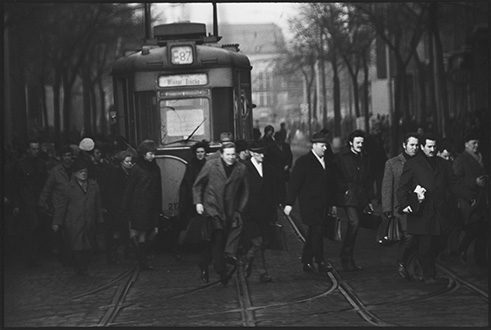 After German reunification, Bergemann, together with Fischer and other colleagues, founded the Ostkreuz photographers’ agency. She also started to work for the large West German magazines like Spiegel, Stern and Geo. While travelling in Africa she discovered colour film and a trick that she could use. Where she herself was unwilling to stage a scene, she turned to a subject that did it of its own accord: the theatre. By showing theatre practitioners at work in Africa, and later in Berlin, she allows an element of illusion and enchantment to enter an otherwise extremely real world. 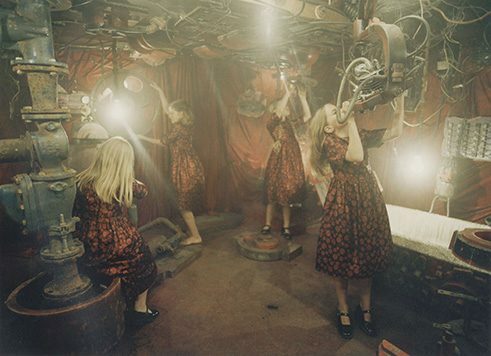 Dream Factory, Photographs relating to Wenzel Storch’s Film, Die Reise ins Glück (The Journey to Happiness), Hildesheim, 2000 | Foto: © Sibylle Bergemann Image courtesy the Estate of Sibylle Bergemann On the one hand, reunification and the end of East Germany brought bitter disappointment for Bergemann, for instance when she had to move out of her beloved apartment as it had been sold to developers. On the other, Bergemann enjoyed the widest acclaim in her reunited country. Since 1994 she had been a member of the Academy of the Arts in Berlin, had taught photography at several colleges. Today, Bergemann’s works are on display in the German parliament, the German Historical Museum and, until early January 2016, at the NGMA in New Delhi.